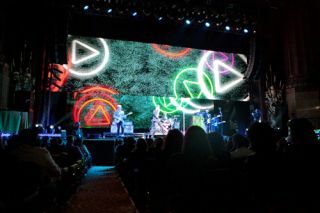 WorldStage provided video and lighting support for the first YouTube advertiser’s upfront at New York City’s Beacon Theater. YouTube has launched YouTube Brandcast, giving marketers and agencies a first look at YouTube’s new original programming and insights into the world’s biggest audience. WorldStage provided video switching, cameras, LED walls, lighting and rigging. “The event had a very ambitious design, especially in the small space of the Beacon,” said WorldStage event manager Josh Perlman. The upfront used a custom Musion screen to provide a 3D Holographic effect. The screen, which is typically teamed with projectors, was paired with a 6mm LED wall instead. “In order for this to work, we had to use a high-res wall and lay it flat on the floor – something a high-res wall is not really meant to do. So we worked closely with the Good Sense team, which included Hudson Scenic, to design a frame to support the LED tiles. This massive frame, which was fabricated by Hudson, lifted the tiles off the ground to provide space for our crew to wire and perform maintenance,” said Perlman. WorldStage also furnished 20 LCD monitors scattered around the venue and utilized as remote viewing and confidence monitors. “Each was an output on a large HD-SDI router so we could route any signal anywhere,” said Perlman. Show content was created by Ant Farm and played back on servers provided by Obscura Digital. The show was recorded in HD via a three-camera HD package provided by WorldStage. WorldStage also supplied the lighting for lighting designer Chris Dallos, including VARI*LITE VL1000s and VL3500s, as well as conventional fixtures; and a handful of LEDs. Lighting was programmed on a grandMA2 console. Rigging provided consisted of 12-, 16- and 20-foot box truss and motors from one-half to 2 tons.